Hip disarticulation is an amputation through the hip joint capsule, removing the entire lower extremity with closure of the remaining musculature over the exposed acetabulum. 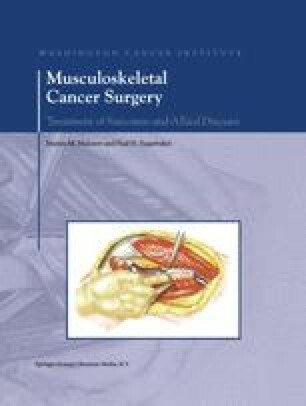 Although performed commonly in the past for malignant bone and soft tissues below the lesser trochanter of the femur, today, the majority of these sarcomas can be treated with limb-sparing procedures. When indicated hip disarticulation provides a low risk amputative alternative that may show function early after the amputation with a modern prosthesis. With intensive physical and rehabilitation patients may become ambulatory with a cane at approximately six months.